4 Ways To Make Pizza While Tailgating this year, I wanted to cover as many ways to make pizza while tailgating as I could find online. 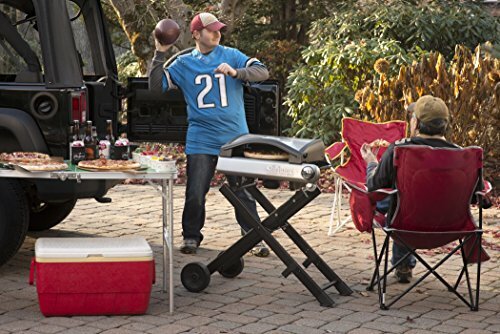 The standard tailgating food is things like burgers, hot dogs, chicken, steak…all grilled meats. They are delicious, for sure, but sometimes it's nice to mix things up, especially if you tailgate a lot. Some of these pizza making accessories are quite cool, and will definitely turn some heads. For those with a truck, or anything with a bed, a tabletop pizza “grill” (more like an oven) is the perfect choice. Even if you don't have a truck bed, but are brining a folding picnic table, this could be a good option. 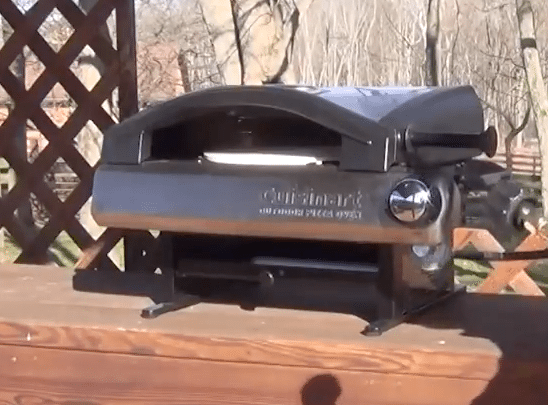 It's a made-for-pizza gas grill that comes with a pizza stone and will get hot enough to bake your pizza fast (the right way). These tabletop pizza “ovens” will fit in the truck or backseat of any car. The Pizzacraft Pizzaria Pronto is a very cool item that fits in this category. It's very portable, but makes a good medium-sized pizza. All you need is 3 items to use this and make awesome pizza at a tailgate party. The pizza peel is the thing with the long handle that puts the pizza in and pulls it out of the oven. I would recommend getting both a wooden and a metal one if you can, but just one will do if not. The wooden one is best for putting the pizza into the oven since it's less sticky and easier to get the dough off. The metal one is better at scraping the pizza off the stone if it gets stuck, and it won't burn like the wooden kind. You can get a 1 lb propane gas tank anywhere. It'll run for two hours on one tank. Considering you can make a single pizza in 5 minutes, you could make enough pizza for the whole parking lot in two hours! You can also use this with a regular 20 lb propane tank if you want though! There are other options for countertop pizza ovens [LINK], but the Pronto is my favorite model. Link coming soon to a full review of countertop pizza options! However, Cuisinart makes a great one as well. It fits on the countertop, plus it has a set of legs you can buy, so it's a great alternative to the pronto. If you don't have a truck or a folding table available to you, a standing pizza grill is a great way to go. How portable the item is depends on which brand you go with, but there are some cool options. One possibility, is to still stick with the Pizzaria Pronto (above), and just buy a matching set of leg accessories. You'd be able to break it down and set it up quite easily, though you do need to make sure you have enough room in your car! The measurements are 17 x 35.5 x 17.4 inches. Don't forget that the Cuisinart model also has legs as an option! They are foldable, so this option may work better if you are limited on space. Another option which has a two-piece pizza maker is from the brand Camp Chef. This option is quite a bit bigger, but you get a bigger pizza oven too. The product is called the Camp Chef Italian Artisan Pizza Oven. 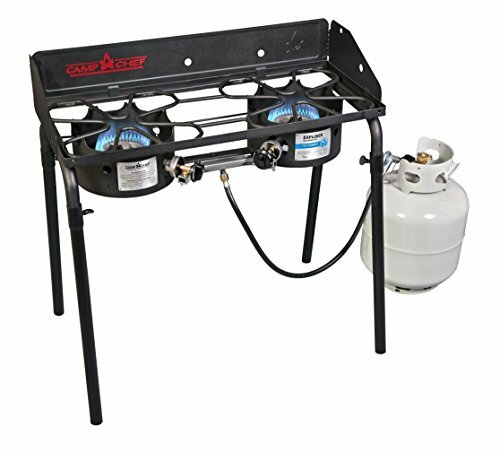 The downside is that you have to buy the actual burners separately, and it won't work with a lot of other gas grills because of the size/heat requirements to function properly. Surprisingly, the combination of the pizza oven and the gas burner is cheaper than the Pizzaria Pronto! Of you compare both standing versions, then this combo is about 1/2 the cost! The good thing about going with the Camp Chef brand is that you can then use the double gas burner for other activities as well. 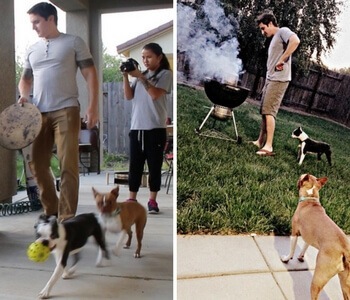 It's great for camping, or backyard barbecuing, or even would fit on a balcony for grilling in an apartment building. Also, remember you can grill anything on this since the Italian Artisan Pizza Accessory can be removed, versus a made-for-pizza product which only cooks pizza. Once you break out the charcoal grill, making pizza becomes a lot more relaxed. You can essentially just toss a pizza on the grill and be done. Yes, grilled pizza is delicious. Upgrade a little with a pizza stone designed for barbecue conditions, and now you almost have an authentic pizza oven. I go through 8 different ways to turn your charcoal grill into a pizza oven, but by far, my favorite is to use the KettlePizza grill insert. Because it makes legit, wood-fired pizza. 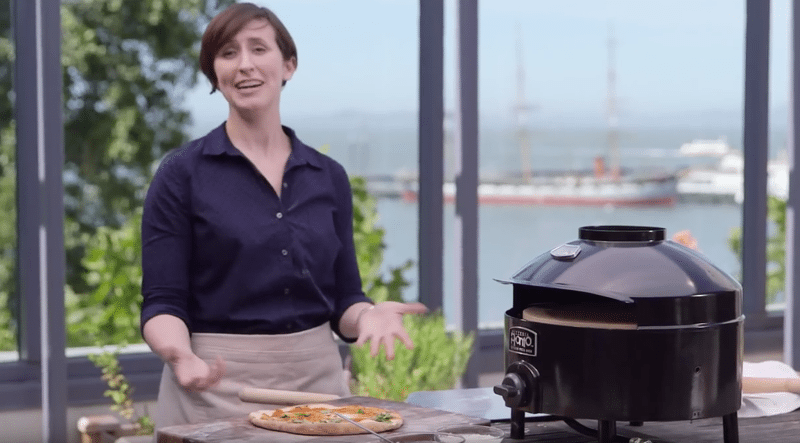 Essentially, you toss a couple chunks of wood onto your charcoal bed, add the insert so you can get your pizza in/out easily, and now you have an 800º oven, making smoky, wood-fired pizza. 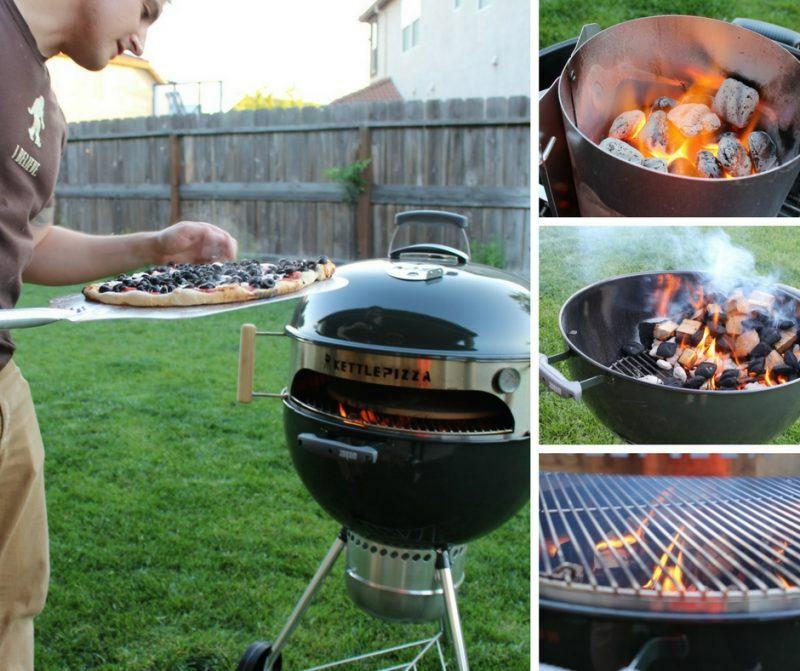 As long as you can fit the grill in your rig, you can take your pizza oven anywhere. 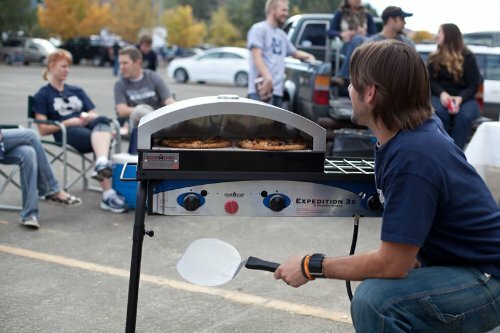 When it comes to portable pizza ovens for tailgating, this is the best option in my opinion! But it does cost more than any of the other options. By the time you buy a Weber Kettle grill, then get the KettlePizza, plus the stone and peel, it becomes a big investment. However, keep in mind that you'll then have a pretty-much-authentic pizza oven you can take anywhere. I use this all the time in my backyard. You could also take it to your friends house, or camping. And although you may spend a few hundred dollars getting set up with this, it's still a fraction of the cost of investing in a backyard pizza oven. 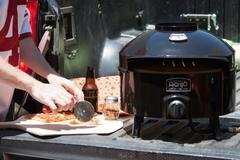 You are here: Home / Outdoor Cooking / 4 Ways To Make Pizza While Tailgating!